NIGHT OF THE LIVING DEAD. 1SH ORIGINAL MOVIE POSTER 1968. CONDITION: LINEN BACKED EX-NM C8-C9. For 1000's of Vintage Movie Posters. If it has any minor defects like pin holes, creases, etc. Highly sought after by movie poster collectors and aficionados. Get notified of our AUCTIONS & NEW INVENTORY instantly! This is what all you zombies have been waiting for! This is a genuine 27"x41" U. One sheet ORIGINAL MOVIE POSTER issued by the studio when the film was released and meant for theatrical display. This poster has been Linen Backed and is ready for framing. These can be very difficult to find in any condition! A long time can go by without one of these coming up for sale. You will have trouble finding a nicer one. CONDITION/GRADE: C8-C9 EXCELLENT - NEAR MINT. Typical very minor fold line touch up/restoration. This poster is considered to be within that class and is definitely INVESTMENT QUALITY. This is NOT a reprint or reproduction poster! It is a REAL ORIGINAL MOVIE POSTER issued by the studio when the film was released and meant for theatrical display. Unless otherwise specified, poster measurements quoted above are approximate to the nearest inch. For example, if we say a one sheet poster is 27" x 41" its precise measurements may be closer to 26 3/4" x 40 7/8" (or something similar). This slight variance is quite common for all original movie posters. BEWARE OF "FAKE" MOVIE POSTERS! There are fakes, bootlegs, reprints, and reproductions of almost every popular movie poster. WE DO NOT SELL THESE AS ORIGINALS LIKE OTHERS DO! There are many unscrupulous dealers who successfully pass off these posters as originals. They have been doing it for years! These fakes are almost indistinguishable from originals, only experts can tell. They only discover years later when they sell them that they are worthless. Most are from popular movies from the 70's and 80s, but there are also really old ones and relatively new ones as well. They usually appear in insert size 14" x 36" and one sheet size 27" x 41". Again, all we can say is BEWARE! We grade our posters according to the Iguide Universal 10-Point Movie Poster Grading Scale. C10 Mint - Investment quality. You must notify us before sending it back. This is extremely rare, but it does occasionally happen. We know how to create a listing that will provide you with the highest dollar possible. We can yield for you MUCH MORE than you would get if you auctioned them yourself up to TEN TIMES or more! Let us sell your posters for you! For more information about CineMasterpieces please see. We guarantee that all posters we sell are graded and described accurately. Unless otherwise specified in the description, ALL POSTERS ARE ORIGINAL MOVIE POSTERS original theatrical movie posters that were displayed or meant for display (unused) in theaters at the time the movies were released. We will put in writing that we guarantee it to be an Original Movie Poster. 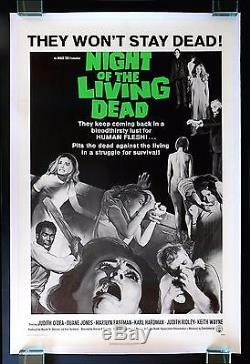 The item "NIGHT OF THE LIVING DEAD CineMasterpieces ORIGINAL ZOMBIE HORROR MOVIE POSTER" is in sale since Sunday, November 09, 2008.